Western Hay boasts one of the most impressive transport fleets in the WA stockfeed industry. We have a range of vehicles for every requirement, from our little 6 pallet curtainsider for quick local and metro deliveries, to our two 12 pallet curtainsider and flat top trucks, right up to a 90 tonne rated road train. Whether you require products delivered to a busy metro location or a long haul to the far north of WA, we cater for deliveries big and small. Some of our trucks can be equipped with an all terrain forklift to unload pallets onsite if required. Our factory is located only 140 kilometers from the port of Fremantle. We can arrange fumigation and shipping to anywhere in the world. 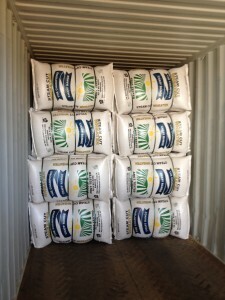 Our chaff products will be packaged to maximise the loaded weight of your container. Western Hay is a WA owned and operated stock feed business that produces and delivers premium quality hay and chaff. Our biggest client base is the domestic wholesale equine market, which we supply with quality-assured products of the highest possible standard. We are a young and innovative team, committed to providing prompt and professional service. We guarantee you will get the best results from your stock with Western Hay. © Copyright Western Hay 2019 . All rights reserved.